Talks between Iran and six world leaders about Iran’s nuclear program are ongoing and appear to be extended past Tuesday’s deadline for the outline of an agreement. All sides are saying they are making progress, which means a successful agreement that would lift international sanctions against Iran and restrict them from obtaining nuclear weapons is a real possibility. But don’t tell Arizona Republican Senator John McCain that. McCain took to the Senate floor to suggest that Israel “go rogue” and resist any kind of agreement. Not doing so, said McCain, might mean they don’t survive the nearly two years left in the Obama presidency. Officials wait for a meeting with officials from P5+1, the European Union and Iran at the Beau Rivage Palace Hotel March 31, 2015 in Lausanne. "The Israelis will need to chart their own path of resistance. On the Iranian nuclear deal, they may have to go rogue. Let's hope their warnings have not been mere bluffs. Israel survived its first 19 years without meaningful US patronage. 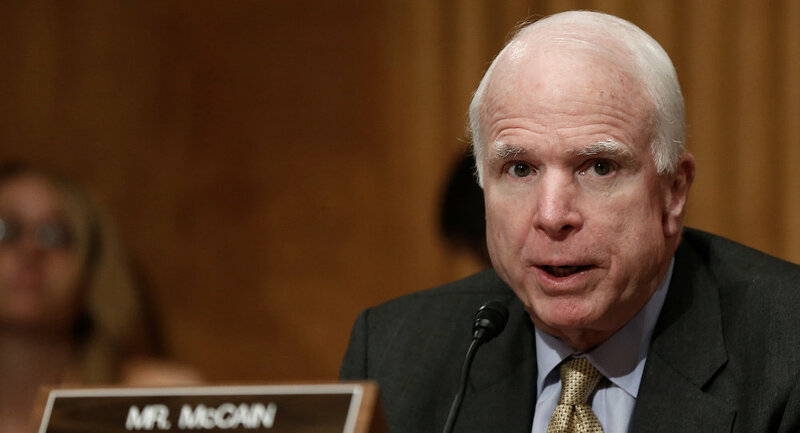 For now, all it has to do is get through the next 22, admittedly long, months," McCain said on the Senate floor. Israeli Prime Minister Benjamin Netanyahu has already criticized the deal, saying it would leave much of Iran’s nuclear infrastructure alone, and that included underground research facilities, a plutonium reactor, and centrifuges that are capable of enriching uranium. For its part, Tehran has said it want to enrich only for energy, science and medical purposes.